Less than five days after touring Migori county, Deputy President William Ruto will on Saturday tour Kuria East sub-county. Ruto will launch a Technical Training Institute(TTI) at Kendege and preside over a fundraiser in aid of over 20 churches in the region. He will be hosted by Kuria East MP Marwa Maisori Kitayama. “All plans to the visit are complete, Ruto will be here to fulfil his promise of officially opening the TTI,” Kitayama said. On Monday, Ruto was hosted by governor Okoth Obado to commission Muhuru-Suna-Kehancha road and also launched a street lighting project at Masara township. 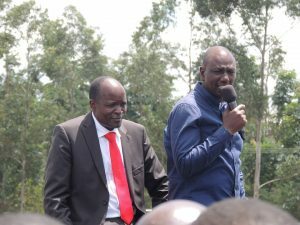 Only Migori Governor Okoth Obado, former Nyatike MP Edick Anyanga, and two MPs from Kuria West and Kuria East – Mathias Robi and Kitayama, respectively–accompanied Ruto. The rest skipped the function all together.